Leopard is everywhere you look this season. 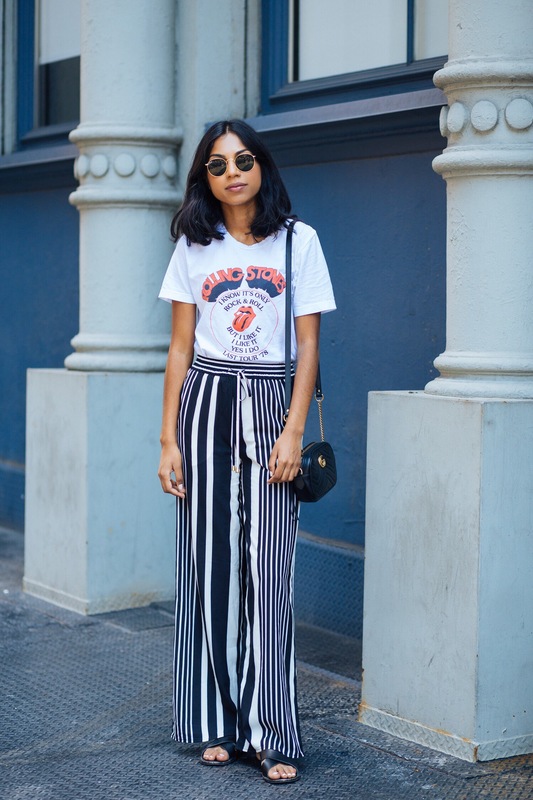 It’s a timeless print you can easily add to your closest for fall. My first nod to the trend in the last few months was a leopard skirt I scored at & Other Stories in the perfect slip style. Of course, I can’t get enough. Being a denim girl, I wear jeans on the daily. These leopard pants I came across at Zara make the print even more wearable and a bit unexpected in a jean. 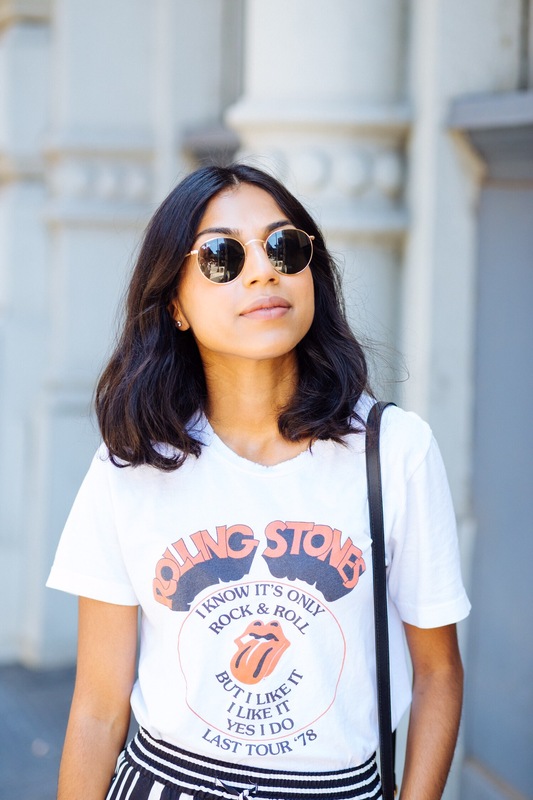 Wear with your favorite neutral tee like me or add a cool vintage style to mix it up. As soon as the temps drop, I see myself styling these with an oversized sweater and loafers. I’ve always been a jeans girl and black denim has consistently been a wardrobe staple for me. Living in NYC, you can never have enough black. It’s timeless, can go from day to night and an all black look adds that model-off-duty edge I can’t get enough of. I’m all about an oversized denim jacket. I couldn’t find the perfect black denim jacket for some time then I realized…why not try a men’s? There’s something very cool about “borrowing from the boys”. This one is by American Eagle and worn in a men’s size small. It gives just the right amount of boxiness without looking like the jacket is wearing me. What’s great about wearing an oversized jacket is that you can layer so much underneath. To stay warm throughout the longest winter of my life (blizzard in March?!) I pair a cozy sweater underneath. This sweater is by H&M and I discovered it via one my favorite fashion bloggers of all time, Sincerely Jules. (Thanks, Jules!) She wore it one day on Instagram and I immediately purchased it via my phone because I’m always on the hunt for the perfect grey sweater. I’ve never loved a sweater more, it’s a great crew neck and has become a piece I’ve repeated all season long. The jeans I’m wearing are also by American Eagle. These are the Vintage Hi-Rise. I sized down in these since they are pretty high-waisted and added a personal touch by cutting the bottom for some undone fringe. I wear these jeans all the time. They’ve faded to a unique greyish-black tone that I love. To complete the look? I’ve added the bold white bootie and Gucci crossbody. I know many people are a bit indecisive about the white bootie but anytime I wear these with an all black look like this I feel like it completely elevates my look. I enjoy wearing these with a wide leg jean or pant to let the shoe really make the statement. Also, these are very comfortable! I scored these at Urban Outfitters and am very pleased with my purchase. Are you ready to make your next denim look black on black? It’s February and it’s still freezing. The parka game may be getting a little old and it gets harder and harder to actually attempt dressing up in the winter. Thankfully, some outerwear trends can make a statement and still keep you warm like the patent puffer. On Black Friday I had ventured into Zara in the suburbs and there it was…shining bright…the patent puffer. I knew I had to have it! Yes, it was a bit ridiculous. Yes, it kind of made me feel like Missy Elliot in the ‘The Rain (Supa Dupa Fly)’ video but I didn’t care — I needed it…and it was on sale! I got that and these boots I’m wearing here which also happen to be borderline patent…I can’t help myself. The heart wants what it wants. For this look, I kept it super simple wearing a black turtleneck sweater by H&M and these amazing jeans by Levi’s in collaboration with Aritzia. They’re the jean I have been searching at every vintage store for…a light wash, non-destroyed pair of Levi’s 501s with a high waist. They do cut at the ankle so wearing a high ankle boot like these are perfect. This puffer may seem a little bold to some but I think it’s a great way to ease into the trend if you’re still a little on the fence. It’s a fun outerwear piece that can also go sporty. 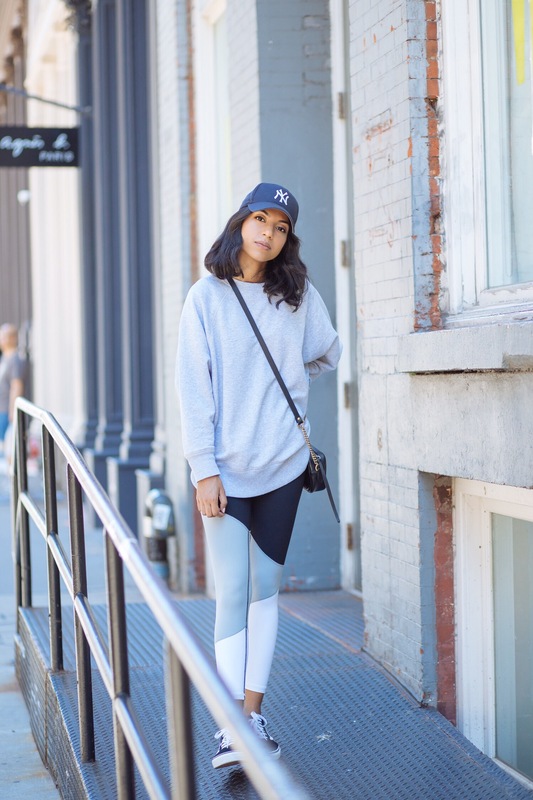 I think it would look great with sweats or leggings for a more athleisure look as well! As the holidays approach, it seems like this month is filled with even more events, birthdays and dinners with friends before family time and some much needed hibernation. When the temps drop it can be challenging to put effort into your outfits. I know I tend to gravitate towards dark jeans and cozy sweaters but sometimes that can get a bit boring for a night out. 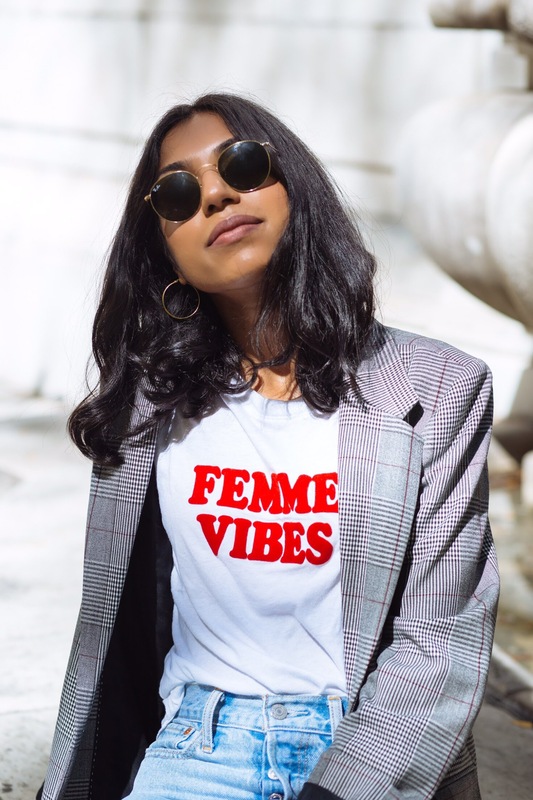 Quick way to upgrade your look? Add a fun blouse! It’s been a while since I’ve updated my “going-out tops” and for the longest time it was a sea of tank tops. However, I came across this top at Zara and was immediately drawn to it. I love the unique shade of blue and contrast of color with the floral print. The drapey fabric is so pretty and fun fact –it’s actually a bodysuit which makes it super easy to tuck into a high waisted jeans. Keeping the rest of the look simple is key. I kept it clean with my go-to black jeans by American Eagle to let the top be the star and added my black ankle boots. I accessorized with my black Gucci bag and gold vintage earrings. Linking below a few of my favorite tops similar to this one to ease you through the holiday season. Happy shopping! TOP: Zara; similar here, and here — also loving this one by Mango. 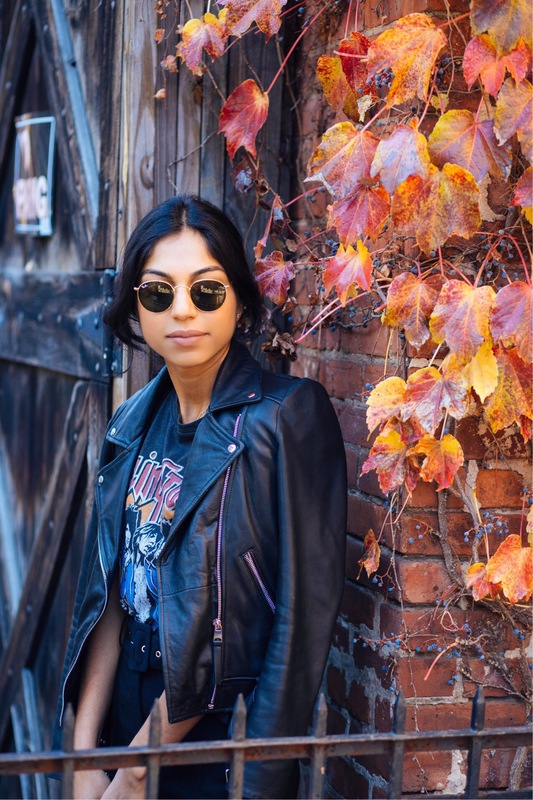 A leather jacket is something that can elevate any outfit. It is so important to invest in one you love. It took me a while to find my favorite after a big debate and I found a great option by Zara. Best part? It was under $200! Links to all my favorites from high to low are on my LiketoKnowit profile here as well as below — happy shopping! Menswear inspired pieces have always been a favorite of mine and this season there’s a print that has resurfaced…plaid. Around NYC and my Instagram feed the plaid blazer began taking over which in turn led me to looking for the perfect one. I normally don’t jump to plaid prints, but something about this in a blazer silhouette felt very wearable and easy to add to my usual casual looks. I found this gem at a store that is very dear to my heart — Target. Can you believe it?! I was home visiting my parents in Indiana and had to make a trip to my classic suburban Target because in the city I don’t have the luxury where the Target inventory is fully stocked and organized. Any New Yorkers feel my pain out there? It was a no brainer. I bought it and about 100 other things I don’t need in a matter of minutes because that’s what happens at Target…you get overwhelmed, excited and all of sudden you need everything. 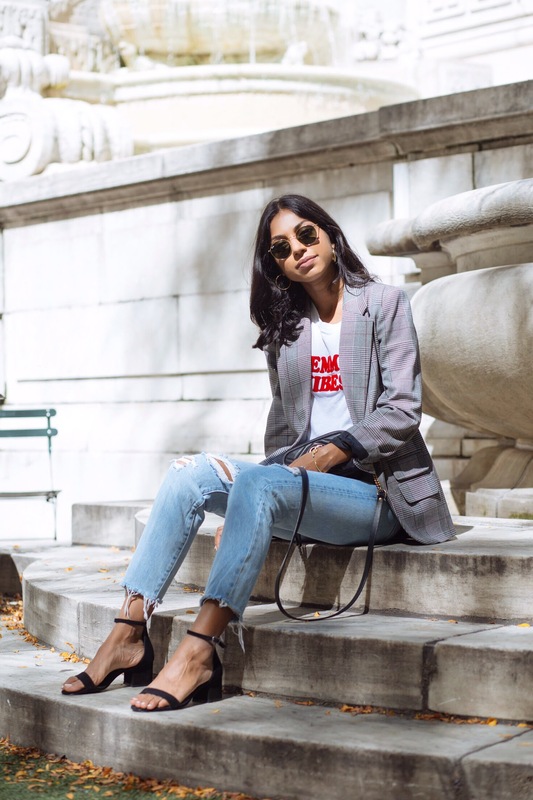 When I got back to NYC, I wanted to style this blazer in a very easy way. 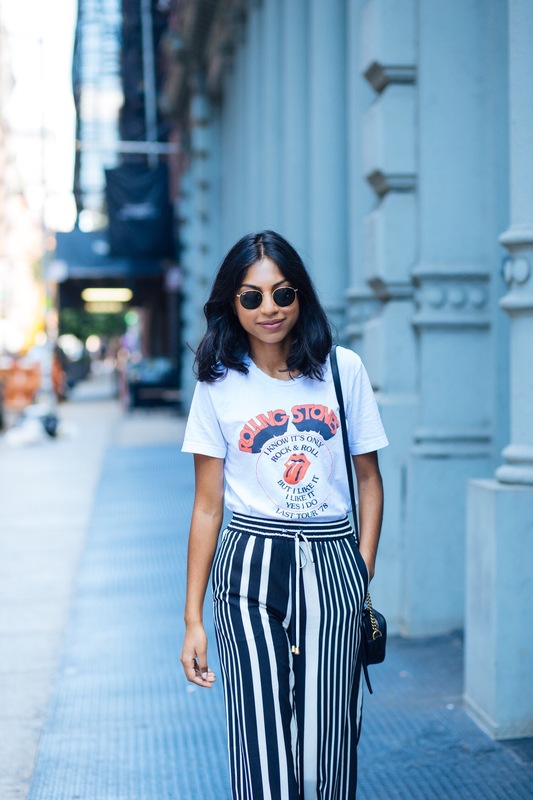 I paired it with a fun graphic tee by American Eagle. 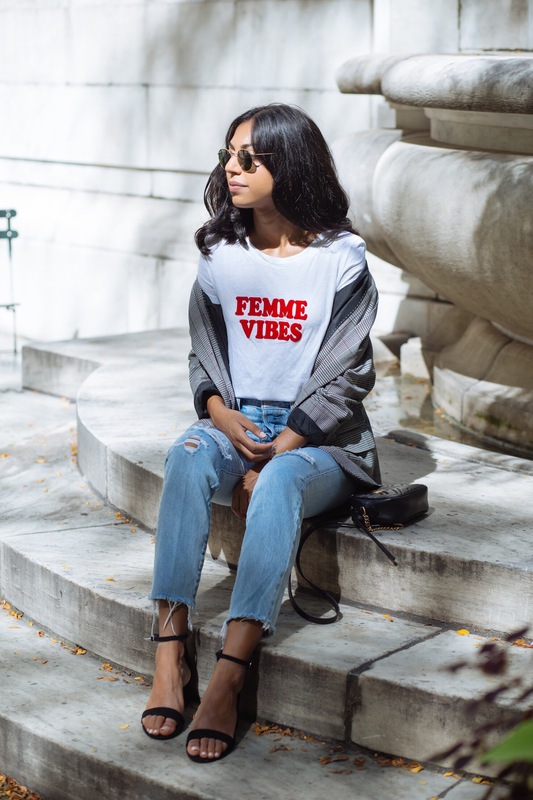 I love the bold red letters and ‘Femme Vibes’ is always a good message. Next, I’ve been obsessed with the Levi’s Wedgie fit jean. 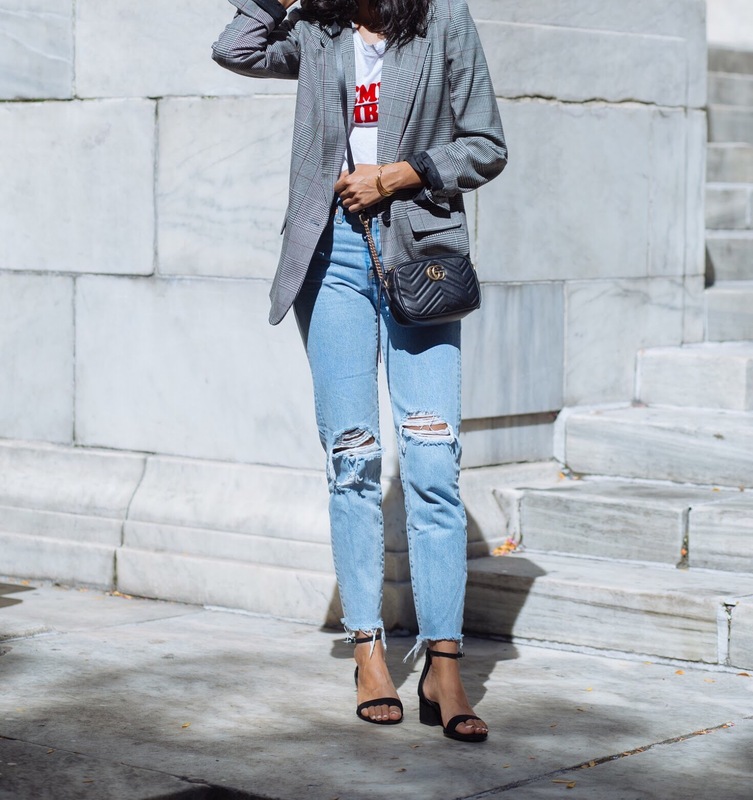 They have just the right hint of stretch and a thick vintage like denim feel without having to go through billions of thrift stores to find the best fit — ideal! 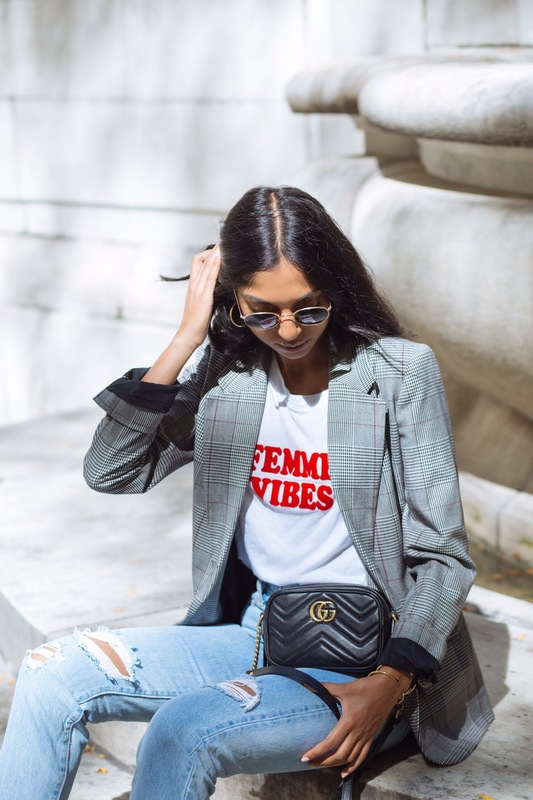 As for accessories, I kept it simple with my Gucci cross-body, minimal black heel by Steve Madden (comfy too–important) and my go-to round Ray-Bans. Are you ready to add a little plaid to your closet? I say yes. It’s the perfect item to throw on when you’re heading out for weekend errands or having a chill night on the couch. I love pairing mine with my Aerie Move leggings — also amazingly comfortable. My favorite part about this sweatshirt is how soft it is. You have to feel it! I also love the oversized fit. I have three colors because I couldn’t just pick one…and at that price, why not?! I styled this with my Aerie colorblock move legging. I love the rise on these and love the mix of white and grey. 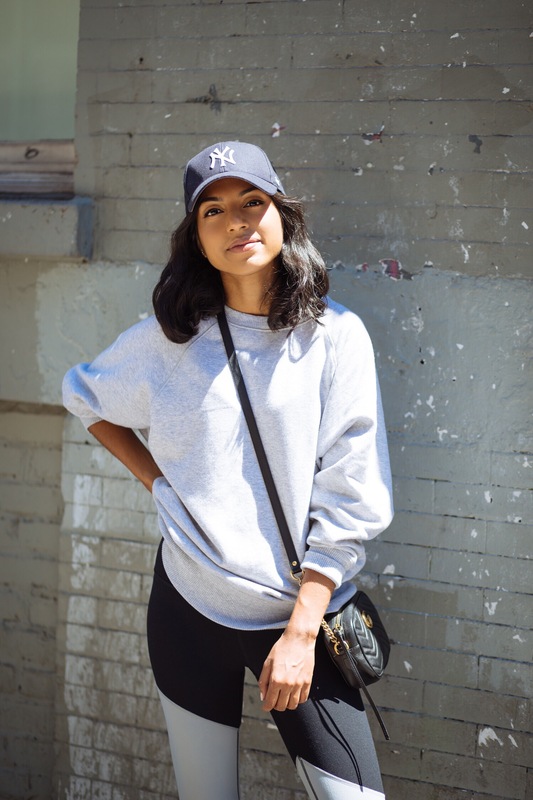 Accessorized with my weekend staples — a Yankee hat (queue Jay Z ‘Empire State of Mind’) , my black Vans and Gucci crossbody I’m ready for a day on the go and effortless as ever. Two closet essentials by Aerie – a striped tee and slip dress. I’m all about a 90’s comeback! Wearing a classic slip dress like this over a t-shirt makes this #OOTD super fun and casual. 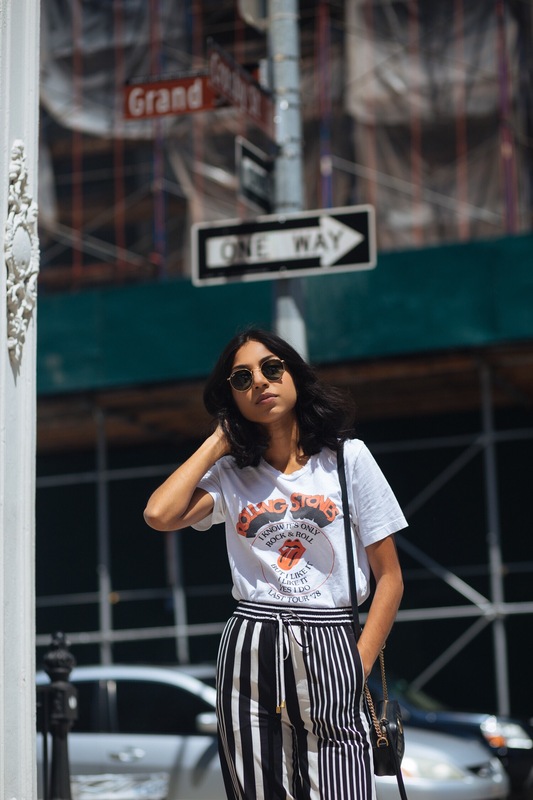 It’s a perfect outfit for running around NYC in the summer heat. 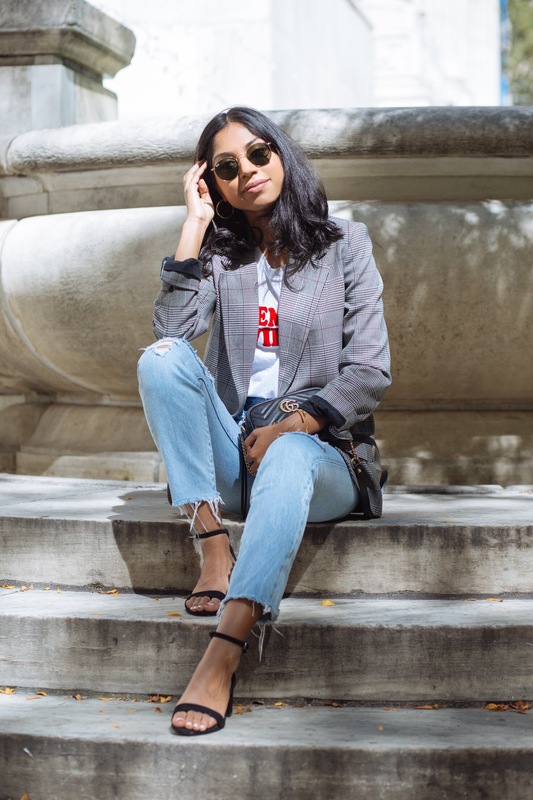 Paired with my go-to sneakers of the moment adds a little edge to my look and not to mention, super comfortable which is so important. 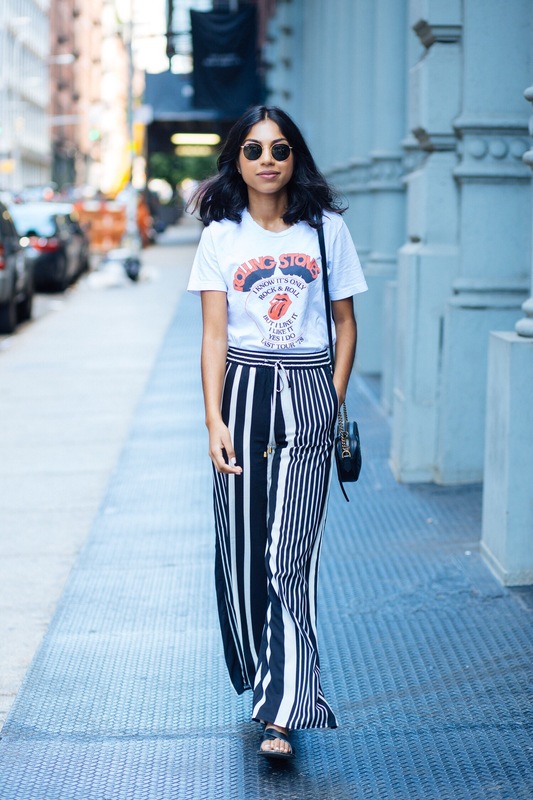 I love the versatility of these two pieces – rocking the tee with a pair of jeans or wearing the slip dress by itself for a night out on the town is definitely in my future. 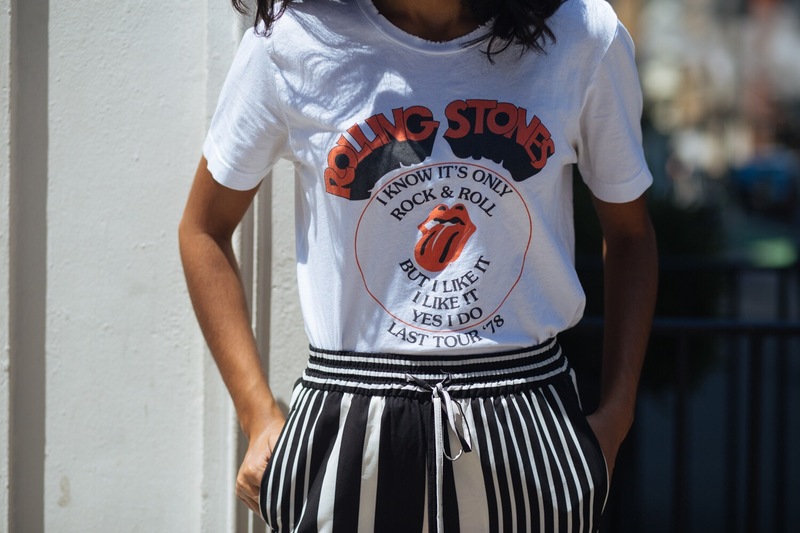 These are two key pieces in my wardrobe I know I’ll be wearing on repeat.